Two Java modules supplied by the OpenAPI project for Swagger 2.0, swagger-models (part of the swagger-core project), and swagger-parser, are core dependencies throughout Swagger's open source stack for Java, and instrumental in RepreZen API Studio's current Swagger support. The Swagger parser consumes an OpenAPI spec and constructs a representation of the spec using the Swagger model classes, with methods to access all of the details. With OpenAPI 3.0, these and other software components will need to be upgraded or replaced. We've used the Java parser and model projects extensively, so this is a great opportunity to create a simpler, more efficient, and more functional replacement. High Performance - The parser needs to be fast and efficient, for frequent parsing of large OpenAPI specs in our editing environment, without noticeable lag. Informal testing shows a 3x-4x performance improvement over the current Java Swagger 2.0 parser. Tolerant Reader - Applying tolerant reader principles to the parser, we wanted to ensure that the parser handles gracefully any input that doesn't fully conform to the OpenAPI language spec. DI-Ready - We wanted an interface-based design that allows substituting a custom implementation for the one we provide, using dependency injection or other mechanisms. Conformance to Spec - Swagger-Models deviates from the OpenAPI 2.0 spec in subtle ways that required awkward pre- and post-processing. We want to ensure that the new core libraries faithfully represent OpenAPI's structure and validation rules. We're currently in discussion with the OpenAPI community about making KaiZen OpenAPI Parser a core component of a reference implementation. Whether or not that happens, we'll continue to develop our parser as an open-source offering, and we welcome contributions from interested developers. We provide a complete set of Java interfaces to encapsulate the OpenAPI object model, in addition to classes that implement those interfaces. This provides maximum flexibility to developers for scenarios like testing with mock instances, and opens the door to the creation of plug-compatible alternative implementations, substituted via dependency injection. Our parser takes a novel approach to consuming its JSON input, by creating API classes that function as "Adapters" of Jackson's JsonNode object. We call these adapters JSON Overlays, and we've created a small, separate kernel framework of overlay classes for primitive types, collections, maps, and objects. The Overlay framework is the basis for our implementation of all the object types defined in the OpenAPI specification, from the top-level OpenAPI object to Paths, Responses, and all the rest. A number of things are made much easier with this framework than with the more typical approach of deserializing JSON into target classes (often POJOs). Separation of Parsing and Validation: An overlay object can bind to any JsonNode value, even if the node is incompatible with the overlay. An invalid node is treated as if it were missing when the overlay object is asked for its value. But the JsonNode is retained, so that a separate validation process can report on the error. This is in contrast to the typical approach of achieving robust validation by writing complicated Jackson custom deserializers, forcing this level of validation to occur during the parsing operation. Bidirectional Navigation: Our overlay framework's base class keeps track of two bits of information that make upward navigation through the resulting structure very simple: each overlay object's parent overlay, and the key by which that parent knows this object. This makes it very easy, for example, to find the Path that an Operation belongs to, or the name under which a Schema is listed in the model's "components" section. Speed: Informal testing suggests that our parser consumes OpenAPI models at roughly 3-4 times the rate of the existing Java Swagger 2.0 parser. There is very little "logic" in the OpenAPI 3.0 specification, aside from validation-related requirements scattered throughout the document (e.g. each name in a security requirement MUST match the name of a security scheme defined in the components object). Most what the KaiZen OpenAPI Parser does is driven by the prescribed structure of an OpenAPI 3.0 spec. The parser has to provide Java interfaces to represent that structure, validate that an OpenAPI instance conforms to the structure, and manage serialization and deserialization according to the structure. For this reason we have chosen to generate the interfaces and implementation classes for all our OpenAPI object classes. We use a simple YAML DSL to define all the types and their properties- for example, an Info object has a title property of type String, a contact property of type Contact, etc. In the few places where non-validation logic appears in the specification, some of these classes need to be augmented with hand-coded methods. 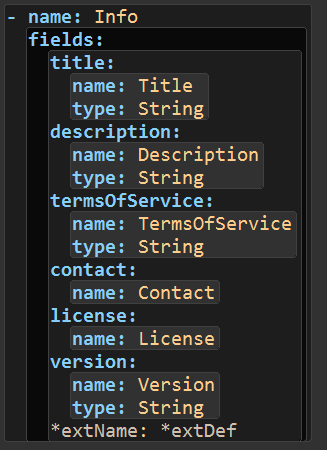 For example, the getServices() method of the Operation object should return the list of services defined locally for that operation, if that list exists. Otherwise, it should fall back to the services defined for the enclosing path, or in the top-level model object. So our generator preserves hand-crafted code by parsing an existing Java source file before overwriting it, and copying any members that are not marked with the @Generated annotation. References are most conveniently resolved in the JSON form of an OpenAPI model, and that's where we do it. All references are resolved before the JSON structure is bound to overlay objects. References are left in place in the JSON structure, but are augmented internally with detailed information. The Java getter methods always provide, by default, resolved values for objects and their properties. However, the fact that a reference underlies a particular value is always available through additional methods, as are full details about the reference itself and the results of its resolution - or the causes of its resolution failure. The first potential source of validation errors occurs in the parsing of the source JSON or YAML document into a JSON structure. We use the Jackson library for this, but without imposing any constraint other than that it should be valid JSON or YAML. If the input does not meet this base requirement, the parse will fail with a generic "malformed input" exception. (The Jackson exception can be examined for details.) Otherwise, parsing will yield an OpenAPI3 object that can be inspected to determine whether it is, in fact, a valid model. All other validation is performed by our OpenAPI parser, in a separate step that follows the JSON or YAML parse. By default, the OpenAPI parser will perform validation on-the-fly, but this is optional. 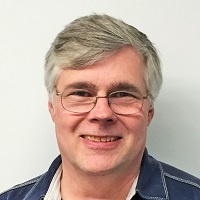 Validation comprises all requirements appearing in the OpenAPI specification, including all uses of the words MUST, SHALL, REQUIRED, and SHOULD (the latter giving rise to warnings), as well as requirements implied by property types (e.g. a "description" property whose value is something other than a JSON text node would result in an error item). In addition, any unexpected JSON nodes appearing in the spec can be detected by the validator. The parser can be configured to treat these as errors or warnings, or to ignore them completely. In all cases, these will be properties of JSON object nodes that are not accounted for in the OpenAPI specification, since by the structure of the specification, any other unexpected JSON node will give rise to a wrong-type-node error. 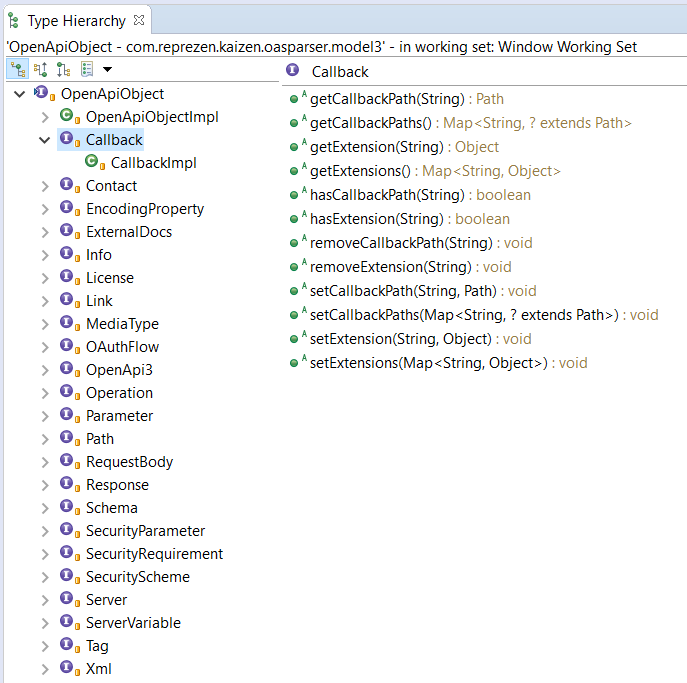 Unexpected property nodes may appear in object types (e.g. an address property in the JSON for a Contact object), or in maps with key restrictions (e.g. a property in the paths map that does not match either the /.+ regular expression for paths, or the x-.+ regular expression for extensions). Most applications will probably involve parsing OpenAPI models from a JSON or YAML source and then working with the model programmatically. However, our Java interfaces also provide write access to every property of every model type, via a highly uniform write API. KaiZen OpenAPI Parser, when complete, will supply a convenient builder for each type. Our serializer will output JSON or YAML that will, by default, reliably render properties within an object, or values within a map or list, in the order in which they were created. This is true whether the model was created by the parser, or from scratch using builders, or any combination of the two. Round-tripping through the parser will never reorder anything unless you specifically make use of ordering options. Using the same code generation tools we have developed for this parser, we plan to create a parser for Swagger-OpenAPI 2.0 as well. It will feature all the same capabilities, and the same uniform interfaces. And as long as your JSON or YAML input has the correct swagger or openapi property, we'll be able to detect the version and invoke the appropriate parser for you automatically. If you'd like more information, you can subscribe here for future blog posts that will dive into greater detail on some of the topics we've touched on. If you'd like to get involved more deeply, check out our GitHub repository. We welcome serious contributors. And by all means drop us a line at api.community@reprezen.com if you have questions, or just to let us know you're interested.